The pages where I write about Emacs. It doesn’t happen very often. I think you’re probably best off following Planet Emacsen. Fair enough. But some comments. When I did that, it told me that it was going to create a token in ~/.authinfo and if I didn’t want that, I’d have to abort and configure auth-sources. Seems reasonable to inform you that the default is not safe. Since I have no control over the default that’s the best I can do. There is a severe bug in Emacs and once again this is completely beyond my control. This is going to haunt me forever because it will take half a decade for almost everyone to update to the (as of now unreleased) version of Emacs that fixes that bug. Turns out that the token was created on the site, but the line was missing in my ~/.authinfo.gpg. The above bug kicked in at a very unfortunate time. There is no way for me to make this change atomic. Telling Github to create a new token succeeded, but then the bug prevented Emacs from receiving the token and storing it locally. And got the error: “transient--layout-member: magit-dispatch is not a transient command”. It means you haven’t updated Magit in a long time. The version you have installed is to old to be compatible with Forge. I have now added some safety-nets that should prevent that when installing Forge from Melpa. It will probably take a few hours for them to become active and won’t help if you have already installed Forge. Just make sure to update Ghub, Magit and Forge to the latest snapshots. By now I’m sick and tired of the entire thing. I remember why using special clients written to new APIs is a pain. Fair enough. Though I would like to point out that many of these issues are beyond my control. For the moment, this doesn’t seem to be better than using either the websites directly, or an email based git workflow and keeping track of issues elsewhere. Ps: I wish bug reports came with such a clear description of what the user tried and how things failed. No worries. I will try again when I get Emacs 27. As Google is planning to sunset Google+ by April 2019, you need to make a backup right now or you’ll forget! I have written a little tool to help me browse my Google+ archive using Emacs. I posted over 2000 times on Google+, and left even more comments. Browsing speed is essential. In addition to just browsing, I also want to copy some of these to my blog. They all need some editing before I do that, however: links need to be checked and fixed, tags need to be added, and so on. Download the archive when it’s ready and unpack it. As you can see, the archive contains my posts and all the comments people left on it. I’m happy to answer any questions or help you adapt the code to your own platform. Anyway, expect to see some old, backdated posts pop up on this wiki as I work through my list. OK, so I want to practice typing using the Workman Keyboard Layout. But how to practice? Recently, codesections@fosstodon.org had a post about typing lessons for programmers using GNU Typist. I also found that my distro also offers Speedpad, a sort of game. And that reminded me of Typing of the Dead, which inspired The Typing of Emacs, a game I once wrote. T h e   T y p i n g   O f   E m a c s . . .
LEVEL 1: 3 SECONDS PER WORD! YOU HAVE 3 LIVES LEFT. own - You can do it! Done - done? - Desist! - 2 LIVES LEFT! such - You can do it! Upcase - Updcase? - Nooooo! - 1 LIVES LEFT! giving - gibuing? - Shame on you! - 0 LIVES LEFT! You have reached 180 characters per minute in 26 seconds by typing 18 words. OK, but now I want to start working on the new Workman layout. Let’s see... I need a “ranking” so that I can start with some “easy” keys and make it progressively harder. Let’s take another look at the basic layer. OK, so let’s prepare a file! Let’s use -i to ignore case. Use that Shift key! The default is 3s per word and I basically can’t type anything in the time required. That should give you a quick selection of difficulty levels. Feel free to introduce keys more gradually. Yet another interesting take would be to use the 2000 most common words from the Brown corpus... And so on! Well, back to the workman-1.txt file for me! LEVEL 1: 10 SECONDS PER WORD! YOU HAVE 3 LIVES LEFT. Noh - You can do it! test - You can do it! tangs - You can do it! Athena - You can do it! sanity - Timeout! - Desist! - 2 LIVES LEFT! entente - Timeout! - Nooooo! - 1 LIVES LEFT! hyaenas - ? - No! - 0 LIVES LEFT! You have reached 47 characters per minute in 140 seconds by typing 23 words. "Dim message if it contains particular phrases. Phrases to take are from `asc:rcirc-dim-keywords'. at the beginning of the ‘rcirc-text’ propertized text." I found this great section in the README to remacs, a “community-driven port of Emacs to Rust.” I had never heard of this effort before, probably because I’m so disconnected from everything. The entire project uses the GPLv3 so that holds for this section, too. Users who have contributed to the README.md file: Wilfred shaleh jaccarmac birkenfeld mrwacky42 jeandudey db48× brotzeit vic setupminimal pnkfelix necto yqrashawn mjfeller andrewmcveigh Fuco1 spacecowboy dk87 c-nixon gitter-badger. Emacs will change how you think about programming. Emacs is totally introspectable. You can always find out ‘what code runs when I press this button?’. Emacs is an incremental programming environment. There’s no edit-compile-run cycle. There isn’t even an edit-run cycle. You can execute snippets of code and gradually turn them into a finished project. There’s no distinction between your editor and your interpreter. Emacs is a mutable environment. You can set variables, tweak functions with advice, or redefine entire functions. Nothing is off-limits. Emacs provides functionality without applications. Rather than separate applications, functionality is all integrated into your Emacs instance. Amazingly, this works. Ever wanted to use the same snippet tool for writing C++ classes as well as emails? Many platforms have a single item clipboard. Emacs has an infinite clipboard. If you undo a change, and then continue editing, you can’t redo the original change. Emacs allows undoing to any historical state, even allowing tree-based exploration of history. Emacs supports a reverse variable search: you can find variables with a given value. You can perform structural editing of code, allowing you to make changes without breaking syntax. This works for lisps (paredit) and non-lisps (smartparens). Many applications use a modal GUI: for example, you can’t do other edits during a find-and-replace operation. Emacs provides recursive editing that allow you to suspend what you’re currently doing, perform other edits, then continue the original task. Emacs has a documentation culture. Emacs includes a usage manual, a lisp programming manual, pervasive docstrings and even an interactive tutorial. Emacs has a broad ecosystem. If you want to edit code in a niche language, there’s probably an Emacs package for it. Emacs doesn’t have a monopoly on good ideas, and there are other great tools out there. 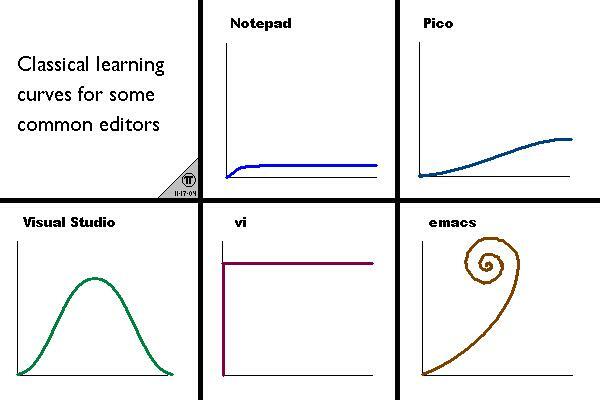 Nonetheless, we believe the Emacs learning curve pays off. Also check out the post by Per Abrahamsen from 2000, what's so fun about emacs? but keep in mind that it was also posted to the newsgroup alt.religion.emacs. My Emacs setup is on GitHub but I might have to finally get rid of my special package handling code and move to something else instead. How about using straight together with use-package? I’m having the same questions. The functional approach of straight is very appealing. Would this approach be able to increase the security ? With security, I mean the fact that the melpa is vulnerable to attacks, much more than a debian/any-other-distro repo or github for example. To be honest, I have never thought much about the security of MELPA and friends. I suspect it is terrible, but then again, perhaps it is not if HTTPS is enabled and certificates are checked and all that, perhaps it is good enough? Debian doesn’t have HTTPS for its repos but has signature checking. We don’t have signatures but HTTPS? Fair? 🤷 I have no idea. Since then, there have been other discussions, which I have not followed accurately. I’m not a specialist, but for those who use emace for everything like notes, mail etc, the possibility of an infected package should be a concern, and i’d love if there would be an approach to solve this. But ... that is not your point in this post ! I found this a while ago, which says you have to do extra work to get Emacs to actually verify https. Thank you both! Very interesting. This is the best blog post about Emacs in a long time. I’m still laughing. Buttery Smooth Emacs, Friday, October 28, 2016. No, really. This blog post just keeps on giving. It’s a great write-up, but this isn’t right: “...a 1980s Symbolics Lisp Machine emulating an old-fashioned Motif-style Xt toolkit....” Symbolics certainly didn’t get its window system ideas from Xt. I’d be surprised if everything else is right! Yeah, I’ve been working on Gopher stuff over the holidays. What fonts should I use on my new laptop? But now I’m thinking perhaps Noto is better? Specially since there are packages for it: sudo apt install fonts-noto fonts-noto-color-emoji and you’re good to go. Except that Emacs doesn’t show me any orange flames when I use 🔥. Sad! Still, in my Emacs config now: (set-face-attribute 'default nil :family "Noto Mono" :height 140). Firefox Purebrowser renders the flame in blue and uses a lineheight of an estimated 600%. This looks very ugly. installing fonts-symbola gives me the black flames back. Not cool, but also not bad. idk abt emojis. there are melpa packages aren’t there? i gave up after trying a few tho. plain text does the trick. Hi Alex, I find Noto Mono to have issues with reading the numeral zero “0” and uppercase alpha o “O”. Not sure how you feel about that. Thats why I prefer using Hack. Good point. We’ll see about that. These things haven’t been an issue for me in many years. Perhaps they will resurface with a new font, haha. In theory, using c and k on all the lines should result in the two source containing the same lines a subsequent call of in-memory-diff showing two empty buffers. Alternatively, a way to use ediff with process substitution such that ediff reads from two pipes would have been nice. Does anybody know how to do this? I don’t think Emacs can do the equivalent of process substitution, because Lisp code cannot see the fd numbers of process objects produced by make-pipe-process. Wow, this is super cool! I wondered whether I’d be able to get ediff to do just that and had given up. Thanks! But do note that in-memory doesn’t necessarily prevent other processes from accessing the pipes as they are file system objects (at least that’s my understanding). That’s correct. I’m mostly worrying about temp files being left behind, or deleted temp files being resurrected. Assuming that the main attack vector I’m fearing is people stealing the disk where my encrypted file and decrypted temp files are on, I think pipes are good enough.